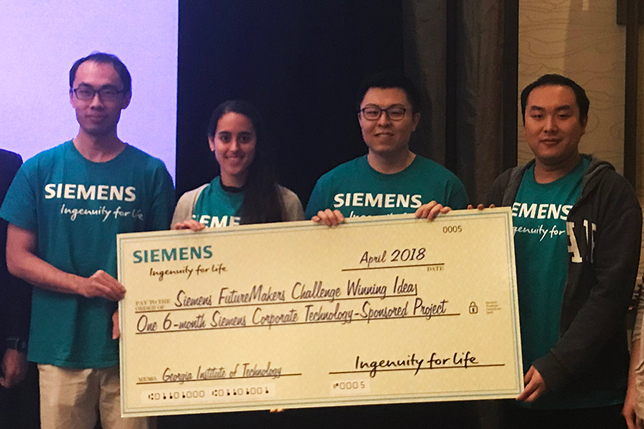 Student teams at six institutions of higher education are continuing work on innovative tech projects, each funded with a $140,000 sponsorship picked up in a series of FutureMakers Challenge competitions run by Siemens' Corporate Technology division. Since the focus of the challenge is to address market needs, the students also interact with Siemens professional staff to commercialize their ideas. Second- and third-place teams also received prizes. At the end of each school's competition, Siemens picked a project to fund, enabling the winning teams to continue expanding on their ideas. During the event, entrants worked around the clock for 24 hours to brainstorm ideas, develop one, and code it before presenting it to judges. At Georgia Tech, for example, a student team will continue development of a computational tool that uses machine learning and topology optimizing to speed digital design and manufacturing. The graduate students — three in civil engineering and one in computational science and engineering — seemed a bit surprised to take the top spot within their institution. Typically, said faculty member Glaucio Paulino, a professor in the School of Civil and Environmental Engineering, in an article about the victory, "civil engineering does not generally win this kind of competition. It's often dominated by [students in] electrical engineering and computer science. For civil engineering to be on the map — I am happy. I am very proud." According to the article, the project involves describing how a proposed design would work, and the tool would "quickly identify the design directions to pursue to create optimized results." Princeton University's winning team came from the electrical engineering department. The two-member team, Zecheng He and Guangyuan Hu, both Ph.D. students, developed an idea for detecting zero-day controller hijacking in power grid systems. They were advised by Ruby Lee, a professor in their department. The top team at Rutgers University tackled food productivity. Team members Merrill Edmonds, Yongbin Gong, Fei Liu, David Ezrapour and Stephanie Rossi from the departments of mechanical and aerospace engineering and plant biology came up with a cloud-based autonomous robotic evaluation system for agriculture. The team at the Massachusetts Institute of Technology focused on artificial intelligence applied to oil well management. Carnegie Mellon University's team came up with an "adaptive and flexible" digital twin assistant for assembly. And students at the University of California, Berkeley developed a hardware-in-the-loop platform for industrial robot learning. The idea of working closely with Siemens, renowned for its engineering technology and innovation, was attractive to the competitors. As one member of Georgia Tech's winning team noted, "It will allow me to be better connected to the engineering practice and apply my knowledge to real-world problems."